Four Vancouver neighbourhoods have been at work, not just putting a dent in their ecological footprints, but also building connection among residents. Top image caption: The mobile place making bike as part of a Green Bloc Neighbourhood project. Last time we checked in, the four Green Bloc Neighbourhoods were just getting started in their journey by measuring their ecological footprint. They've since put in lots of great work creating projects that help build up their community to make a collective impact on their ecological footprints. Kensington-Cedar Cottage: Most of the neighbourhood participants live near Sunnyside Park, a small park in East Vancouver that borders an elementary school. Because families spend so much time in the park, it was decided that their Green Bloc ‘legacy’ project should incorporate some fun, youth-led place making. 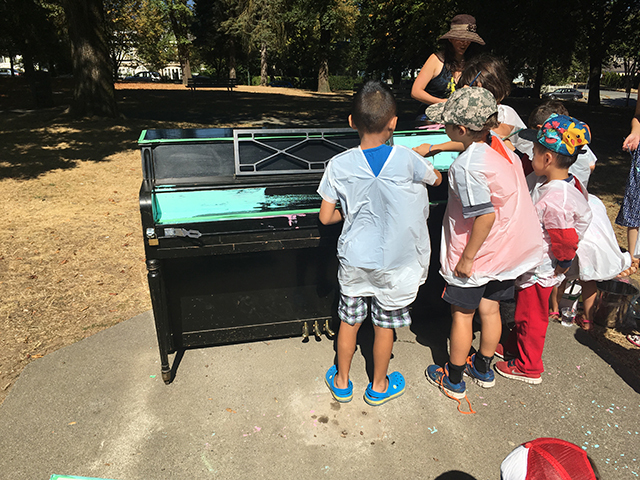 Thanks to Pianos on the Street, a new, public piano has been installed, and an after school class from the school led the redecoration efforts. South Cambie: This central Vancouver neighbourhood has rallied around the idea of a new community garden in Braemar Park. Working with nearby St. Jude’s Anglican Home, a complex care home that borders the park, the hope is to construct an accessible community garden that will feature raised beds, wheelchair accessible paths, and communal gardening opportunities. The neighbourhood recently threw a (rainy!) Park Party to show off their garden concept. Dunbar-Southlands: In South Vancouver, Dunbar-Southlands has connected with the idea of safer streets for their children. On September 16th, they will launch their new block party bike trailer – a mobile place making unit that can be attached to any bike and set up anywhere in the city! 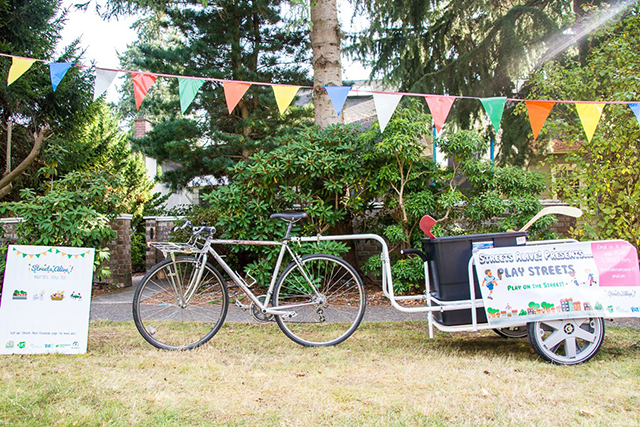 The trailer, funded by Viva Vancouver, features everything needed to throw an awesome block party, including barricades and sporting equipment. West End: In the West End, residents are testing out lots of new recipes with a series of three vegetarian cooking classes. They’ve learned how to host a delicious vegetarian BBQ, and will soon be trying out Indian-Asian cuisine, and hosting a fall harvest feast. Four pollinator hotels are also being installed around the neighbourhood. Green Bloc is supported by the Sitka Foundation and the City of Vancouver.